League of Geeks' first game, Armello, doesn't come out on PC and PlayStation 4 until September 1, but the Australian studio's director and co-founder Blake Mizzi told GamesIndustry.biz this week he already thinks of it as "hugely successful." It's not because the Kickstarted digital board game has basically broken even off a Steam Early Access campaign that began in January, or because of the 92 percent positive review rate Armello has on Valve's digital storefront. It's because the game got made at all, proving out an unconventional salary structure for the startup. At League of Geeks, Mizzi explained, all of the full-time employees make the same base salary. However, the studio also has a "Points System" whereby workers will split half of the profits among themselves after the game is launched. "What we find motivates people is because they are earning profit share... a lot of people go above and beyond what we ask of them..."
"What we find motivates people is because they are earning profit share and they are having a direct contribution into the success of the project, a lot of people go above and beyond what we ask of them and make it as good as it can be so those profits are maximized." The broad strokes make it sound a bit like an experiment in socialist game development, but the details are capitalistic to their core. At the outset of development, Mizzi and a handful of the studio's senior developers scoped out the project, listed all the tasks that need to be completed, and assigned each a certain number of points based on how long they would expect it to take a skilled developer to accomplish it. Work has to be submitted into a build of the game and approved by leads and other members of the team before a developer actually receives the designated points. What's more, developers are responsible for maintaining those tasks and addressing any bugs that crop up in their work later on. The relative number of points each developer has when the profits start coming in determine the ratio at which the employees' half of the money will be split. There's another wrinkle, in that employees only earn points if they're forfeiting their salaries. On days when they take a salary, the points that would have been earned are lost. On days when they don't earn the standard wage, they get points for their work. They can also take on tasks after-hours in order to earn additional points. 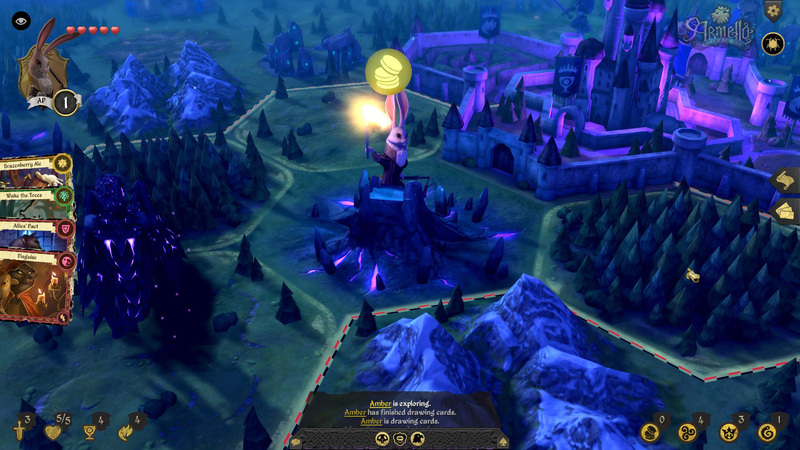 Armello is a digital board game in a fantasy world of anthropomorphic animals. "We've left it up to everyone to decide where they want to stand," Mizzi said. "We're trying to be as open and transparent to everyone as we can." When asked if it amounts to the gamification of salaries, Mizzi conceded, "It absolutely is. And that wasn't our intention. The real core motivation behind this was just to design the fairest system we could. We just wanted a profit-sharing system that everyone could feel really comfortable getting behind." In addition to creating a system that fairly compensated developers, Mizzi said the goal of the Points System was also to allow the start-up studio to keep initial overhead at a reasonable level. "We also wanted to keep the team small and bring on people we couldn't afford to pay. I'm talking really top-tier talent." "We realized with our small budget in cash, we could afford to cover X amount of time and X amount of marketing resources, and the rest we would have to bring on by other means," Mizzi said. "We also wanted to keep the team small and bring on people we couldn't afford to pay. I'm talking really top-tier talent." Obviously, this plan could greatly impact the culture of a studio. For one thing, it can create resistance to hiring new people. When everyone's share of the profits is determined relative to the rest of the team's productivity, more people means a smaller slice of the pie for each individual. Mizzi said League of Geeks has been mindful of that concern, carefully vetting new people as they bring them on. He said between 20 and 30 developers have actually started work at League of Geeks only to leave before they've ever completed a task, a trend with a significant cost attached. "We're getting better," Mizzi said. "We haven't got it mastered, but we're getting better at picking the people we work with... We've been very careful about developers who just see dollar signs in their eyes, who hear about our system and just want to earn points to earn that profit share. We really try to reach out to people who want to join because they love Armello and have a passion for the game, obviously who are skilled at what they do, and the profit is secondary in their motivation." "We've almost never once had anyone come and say to us, 'I have to be paid more.' Because everyone can see their profit points. Everyone can see the velocity they're earning them." The plan has also had some perhaps surprising benefits. Mizzi has particularly enjoyed the way it negated social stigmas about employees discussing their pay. "By having it transparent, it just takes the discussion out of the room," Mizzi said. "It's not a talking point anymore; it's just out there. It just stops there straight away. It's actually really refreshing." Another knock-on effect is that a system without secrecy tempers pay disputes almost before they start. "We've almost never once had anyone come and say to us, 'I have to be paid more.' Because everyone can see their profit points," Mizzi said. "Everyone can see the velocity they're earning them. They can see if they're earning them slower or faster than someone else. It's just apparent the other person is either better than them, or more efficient in their work. It just sort of erodes any of those arguments." On the more predictable side of things, League of Geeks' profit-sharing scheme makes people more invested in the decision-making process, in every sense of the word. "If I go to make a decision about the game design that the rest of the team doesn't agree with or they think is going to damage the game, everyone jumps out of their chairs." "If I go to make a decision about the game design that the rest of the team doesn't agree with or they think is going to damage the game, everyone jumps out of their chairs," Mizzi said. "It's fantastic, because everyone's trying to protect our baby. And it is everyone's baby now. It's really remarkable. It's a beautiful culture around building this game, pushing forward. Everyone's opinion counts. It's not design-by-committee; there's real care by everyone. We're carefully considering and debating out, 'Is this a good feature? Is it worth the time we're investing in it? Is it worth the points we're about to allocate to someone to do this task?' Those are discussions we have every other day about the game. And I think it's great to have those discussions around time, value, and worth for the tasks involved in the game." Mizzi expects the intensity of those discussions to ratchet up a bit as the team decides on its next project. He definitely wants to keep using the profit-sharing system, but is considering reducing or increasing the profit-share amount that will be split by the team on future titles, depending on how it goes with Armello. Right now there's a core team of about a dozen developers at League of Geeks, with a group of about 20 contributors. Going forward, Mizzi would like to see those numbers grow. He believes the profit-sharing plan is a scalable one, but expects his biggest challenge will come in maintaining the studio's culture as he brings in new hires. But that's a problem for the future. Right now, he still has a game to launch. "We just have to launch Armello and see how it goes," Mizzi said. "By our conservative estimates, I don't think it's going to be a disaster, so I'm pretty happy talking to you. It's just [a question of] how much of a success it's going to be." I've worked with BLAKE MIZZI on a couple of projects and he's a really switched on guy. His talents extend to being able to change his name mid-article from Mizzi, then to Rizzi, through to Rizzo and finally back to Rizzi, which he must have settled on. Truly a man of talents and name variations. Good luck to the whole team. Almost never, or never once - which is it? Right now there's a core team of about a dozen developers at League of Geeks, with a group of about 20 contributors. So that's like a 50% burn rate of staff who just turn straight around and leave? I mean that seems incredibly high to me, I've never seen that anywhere I've worked. Kind of sounds like there's a high administrative overhead to all of this as well. Every time you add new features you have to work out the points allocation etc. With these experimental ways of structuring things, I always think it's much more eye-opening to hear from the development staff rather than the management - could you interview a few of those people (and maybe some of the people who left without earning points) to get a more complete view of how motivating and fair this system is from a rank-and-file point of view? Names corrected. Apologies to Misters Mizzi, Rizzi, and Rizzo. Man, that's pretty damn atrocious. A system that favours the rich(er), because they're more able to go without a salary on a daily basis, combined with a system that favours staff willing and able to put in overtime. Social life and downtime be damned - if you need the money *cough* sorry, "points", you're going to do it. It sounds like a very high admin way of getting to a point where a game is designed by committee. Having a manager/designer/lead push through a single vision is much more likely to yield a good result than every single person pulling in the safest direction. Doubly so if they all disagree on what direction that is. League of Geeks seem to be going really well, and it is largely built on this points system. They've been developing the game for several years now, and as far as I can tell, everyone that I talk to who's worked there has enjoyed it, and likes being part of a new enterprise, that's kickstarting itself using this points system, rather than "just not paying anyone", etc. They set up their legal stuff carefully at the start, to protect themselves, and their developers, and it really seems like they've created and refined a system that has worked for their project. I personally have a student (of Game Design and Production) who started working there as a tester / QA Lead, and they've only had positive things to say. It sounds like the points system has been working well for him for that past year. And, it's not "design by committee", there's still a structure of leads, and designers, and producers, etc... people have specific roles. I'm not sure how well the points system would work in an on-going company, working on many titles, as I guess once a company becomes self-sustainable, it may make more sense to pay people, rather than give them stakes in the company/product. But I have also found that, at companies I've worked at in the past, I think I would remain MORE invested in the company, and the products, if I had a greater stake in them.